Rare bacteria claims south Jersey man's left leg below the knee. MARLTON, NJ, February 14, 2018 /24-7PressRelease/ -- A South Jersey man's life was changed forever when a rare bacteria claimed his left leg below the knee. Christopher Botta's story begins 3 years ago when he became sick with an infection and high fever. According to Botta, he "felt like death," but managed to drive himself to the hospital. Accord to doctors, had he gotten there any later he could have died. Bacteria got into his foot through a crack in his skin, nearly killing him. Botta was contacted by Prosthetic Orthotic Solutions International (POSI) following his amputation. POSI picked him up from his home in South Jersey and took Botta in for his appointment at POSI's Marlton location. "POSI drove the 40 minutes to my house to pick me up and then even took me home, I knew I found the right place." Botta was fitted with a prosthetic below the knee by the staff at POSI. During his very first prosthetic leg diagnostic fitting he took his first steps with his brand new below the knee prosthetic. According to Botta, POSI's organization and his personal mental preparedness allowed him to overcome the hurdle of mobility after his amputation. 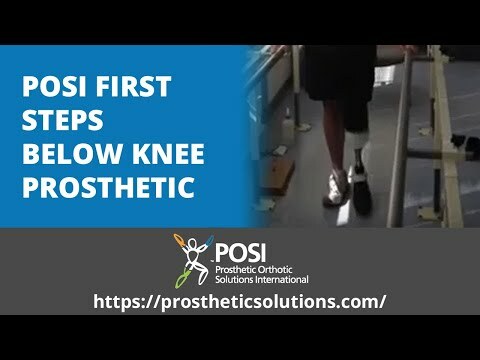 Christopher Botta takes his first steps after begin fitted with a prosthetic leg at POSI.